With a background in Computer Information Systems, Instructional Designer and a Graphic & Web Designer I have many years of experience as a College Instructor as well as a Freelance Artist & Computer Trainer. I have the pleasure and satisfaction of working with students and faculty as well as corporations and independent clients. 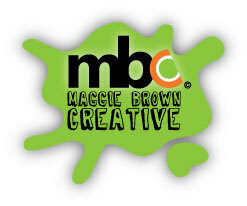 Maggie Brown Creative© Services offers cost-effective training solutions and ​computer design resources that serve a purpose. Maggie Brown Creative© Copyright 2016. All rights reserved.